Home > Blog > Thank you Robert Borland! From time to time on this blog I like to post about other companies with whom Everything Summer Camp is proud to do business. In March I talked about some great companies—Kamik, Woolrich, Crazy Creek, and Kelty. For today’s post I want to talk about The Bug Patch—not the actual patch, but the company responsible for it, Quick Start Marketing, LLC. Last week, I posted about the way that the actual Bug Patch works (which pretty much necessitates a post completely on its own). But in summary, it works by placing a uniform shipment of the B1 vitamin—thiamin directly into your bloodstream. The B1 thiamin then gets secreted through your pores as you sweat, which masks the odor of carbon dioxide that the bugs seem to like so much. The bugs won’t even realize you’re around! It’s a pretty clever idea that belongs to a Mr. Robert Borland. Robert’s Bug Patch works on a completely natural level. There’s no DEET or any other chemically-based activity happening underneath this natural insect repellent. And The Bug Patch leaves you with no smell, no residue, no restrictions, no bugs! From ticks to mosquitoes to chiggers to gnats to black and yellow flies, the Bug Patch guarantees your protection from all of them for 24 hours using just one patch! The Bug Patches have been awarded the National Parenting “Seal of Approval,” so you know that it’s a perfectly safe insect repellent for kids. This product is 100% natural and doctor recommended. Robert started marketing The Bug Patch in 2004. And for the last nine years it’s really created a buzz since Quick Start Marketing, LLC was first founded in Robert’s garage. The company has grown and expanded since then, now occupying larger facilities in Pinckard, Alabama where all of The Bug Patch’s packaging, shipping, and administrative functions happen. 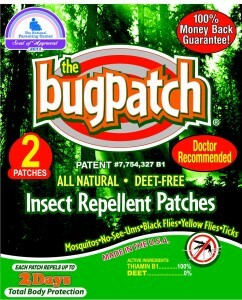 Everything Summer Camp is thrilled to be offering such an ingenious product as Robert Borland’s Bug Patch!